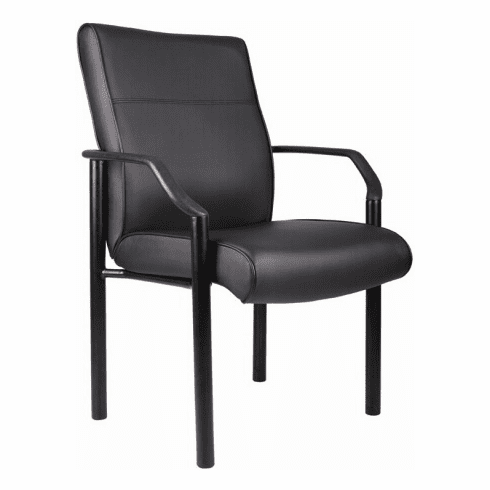 This executive styled leather waiting room chair from Boss Office Products features LeatherPlus™ upholstery. LeatherPlus™ is genuine leather that is polyurethane infused for added softness and durability. Other features include thickly padded, foam filled seat and backrest cushions, contoured backrest cushion, waterfall seat edge to help reduce fatigue on the legs, integrated armrests and a polished steel frame with four post legs for stability. This chair is a perfect match as an office side chair to our offered Boss leather desk chair. This chair meets or exceeds ANSI/BIFMA standards. Dimensions: Seat Size: 19.5"W x 21"D. Arm Height: 26"H. Seat Height: 19"H. Overall: 35.5"H x 26"W x 25.5"D. Six year limited warranty from Boss. This chair normally ships within 2-3 business days from either our CA or GA warehouse.